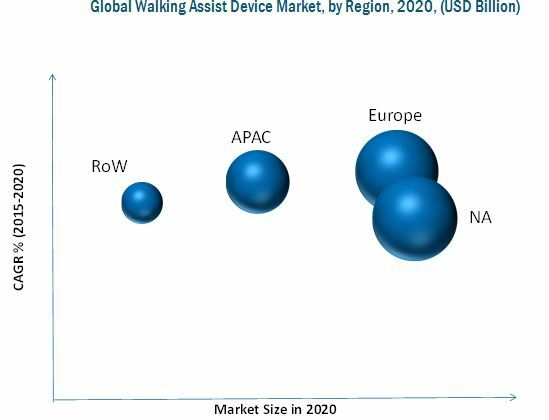 The global walking assist devices market is expected to reach USD 6.57 Billion by 2020, at a CAGR of 3.9% from 2015 to 2020. The global market is expected to witness growth in the coming years, owing to factors such as the increase in the number of initiatives undertaken by governments of various countries to ensure availability of walking assist devices to a huge consumer base, rise in aging population, and increasing incidences of Debilitating Neurological Diseases & Injuries. Moreover, the trends in patient community and growing technological advancements & product leasing are also expected to drive the growth of the market. However, cost of purchase of walking assist devices is high. Global market is broadly classified on the basis of product and geography. Based on product, the market is broadly segmented into gaits belts and lift vests, canes, crutches, walkers, wheelchairs, and power scooters. The wheelchairs segment contributed the largest share of the market in 2014. The geography covered in this report are North America, Europe, Asia-Pacific and Rest of the World (RoW). The market in North America accounted for the largest share of the global market in 2014. This report categorizes the global market for walking assist devices on the basis of product, and region. This report on the Global Market is analysed and segmented on the basis of product, and region. It analyzes the competitive developments, such as alliance, joint venture, and merger & acquisition of the global market. This market is also analyzed with an explicit focus on the high-growth applications and fastest-growing market segments. The walking assist devices are generally used by the patients suffering from spinal cord injuries (SCI), hemiplegia and other types of paralysis, multiple sclerosis (MS), cerebral palsy (CP), amyotrophic lateral sclerosis (ALS), arthritis, and lower-limb amputations. The market is broadly segmented on the basis of product and geography. Based on product, the global market is classified into gaits belts and lift vests, canes, crutches, walkers, wheelchairs, and power scooters.The wheelchairs segment of the global market is the largest and also the fastest growing segment. The rise in geriatric population across the globe and increase in the number of patients suffering from mobility impairment due to spinal cord injuries and paraplegia are some factors leading to growth of the wheelchairs segment of the global market. The report provides a detailed analysis of the market for each region and country. Four major regions covered in the report are North America (the U.S., Canada, Mexico), Europe (Germany, France, Italy, Spain, U.K.,), and Asia-Pacific (Japan, China, India, Australia, Republic of Korea) and Rest of the World (RoW). A deep-dive analysis on pricing pattern, usage pattern, end user response matrix, market share, government initiatives, product recalls, new product launches, industry trends, and technological advancements has been detailed in the report. North America accounted for the largest share in the global walking assist devices market in 2014. The walking assist devices market in the North American region is mostly driven by factors, such as presence of supportive government policies, sophisticated healthcare infrastructure, and increasing geriatric population base. Europe is the fastest growing region in global market in 2014 due to increase in technological advancements in the healthcare sector and development of new products that are equipped with gadgets. The report also covers the competitive landscape of global market by new product launches, recent developments, and mergers & acquisitions. The major players operating in this market are Honda Motor Co., Ltd., Permobil Inc., GF Health Products, Inc., Invacare Corporation, Besco Medical Co., LTD., Betterlifehealthcare Ltd., C.T.M. Homecare Product, Inc., Ottobock, Ossenberg GmbH, Pride Mobility Products Corp., Aetna Inc., Sunrise Medical (US) LLC, and Karma Healthcare Ltd., among others. 11.6 Electric Mobility Euro Ltd.
11.13 GF Health Products, Inc.
11.14 Karma Health Care Ltd.
11.15 Honda Motor Co., Ltd.
11.16 Pride Mobility Products Corp.